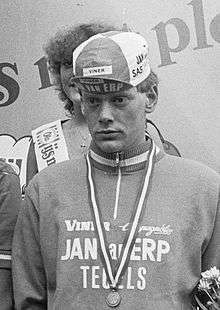 Bert Oosterbosch (born Eindhoven, July 30, 1957, died Lekkerkerk, August 18, 1989) was a Dutch racing cyclist. Oosterbosch was a successful track and road racer. In 1978 he won the World amateur team time trial championship (with Jan van Houwelingen, Bart van Est and Guus Bierings). A year later, he turned professional for the TI-Raleigh team of Peter Post. That year he won the World Professional individual pursuit title beating Francesco Moser in the final. He was also three times Dutch pursuit champion. As a professional Oosterbosch was especially successful in time trials; he won 14 stage race prologues, including three in the Tour de France. He won three other stages of the Tour: his victory in Bordeaux in 1983 was the one hundredth Dutch stage win in the Tour. Oosterbosch also won stages in the Vuelta a España and the Tour de Suisse. In 1982 he won the Ronde van Nederland. Oosterbosch suffered poor health on occasions, twice contracting meningitis. In 1988 he was hit by severe knee trouble and had to end his professional career. He returned as an amateur and on August 13, 1989 he won a race. Five days later he died, aged thirty-two years old, after an acute cardiac arrest. He was buried at the Roman Catholic Cemetery Our Lady of Lourdes in Eindhoven. His tombstone depicts cycle racing. Bert Oosterbosch was married to Marian Bik. The couple had two daughters: Nathalie and Joyce. It has been suggested that Oosterbosch's early death was caused by EPO use, but this is disputed. Willy Voet, the disgraced former soigneur, talks about Oosterbosch riding the 1982 Grand Prix des Nations. Oosterbosch came in 18th at more than two and a half minutes behind the winner Bernard Hinault, even though he was expected to do well. Voet said "Oosterbosch was flat from the start due to the Synacthen he had taken. The drugs initially blocked his ability to work hard. An hour after the injection it started working as planned and his tempo increased." In fact, Oosterbosch came third in the 1982 event. Voet may be referring to the 1979 or 1984 runnings which Hinault also won. ↑ Simon Hart (28 June 2003). "Tour de France: Cycle of cynicism keeps rolling on" . Daily Telegraph. Retrieved on 2012-11-18. ↑ Peter G. J. M. Janssen (2001). Lactate Threshold Training: Running, Cycling, Multisport, Rowing, X-Country Skiing. Human Kinetics. pp. 190–. ISBN 978-0-7360-3755-6. Retrieved 18 November 2012. ↑ Willy Voet goes for the jugular in his book. Autobus.cyclingnews.com (20 May 1999). Retrieved on 2012-11-18. 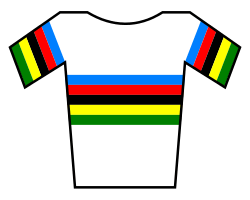 ↑ Palmares of the Grand Prix des Nations at Archived February 23, 2012, at the Wayback Machine.. Memoire-du-cyclisme.net (15 August 2009). Retrieved on 2012-11-18. Wikimedia Commons has media related to Bert Oosterbosch.